Summary: The way I did this walk makes it a hard undertaking as I chose to follow the course of Gunnerside Beck upstream from Middle Bank to Blind Gill. Following the paths on the east bank make the walk much easier and doing it this way I would class the walk as moderate. From Blind Gill I continued to Eweleap Scar before climbing onto Melbecks Moor from where I tracked east to Old Gang Smelting Mills and Surrender Bridge. I then crossed the bridge and over moor back into Swaledale before following the river back to Gunnerside Bridge and on to the village. 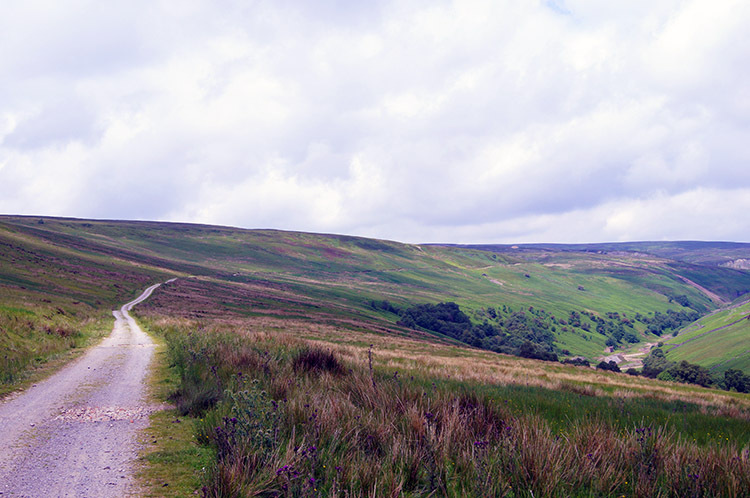 The Walk: I always get excited when travelling to go on a walk in Swaledale. 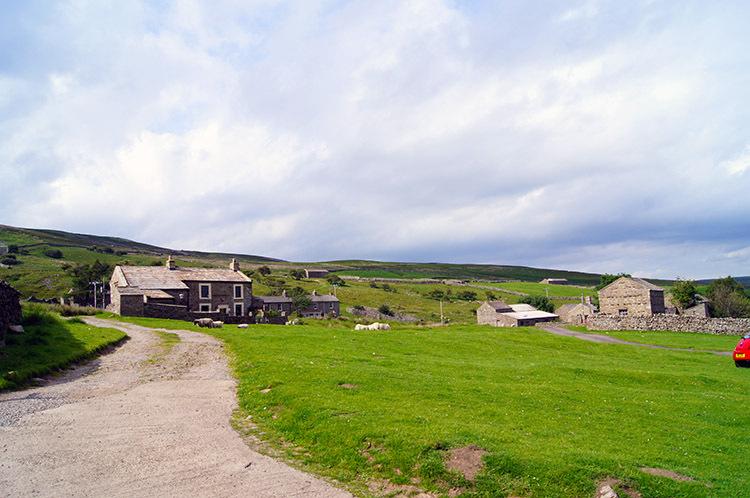 It is one of the most remote of all the Yorkshire Dales from where I live but I never find the extra effort a burden as the unique character of the dale with it's rich pastoral and industrial heritage being alluring draws. I intended to revisit both during this walk with a long overdue return to the impressive remains of Old Gang Mill being particularly enticing. 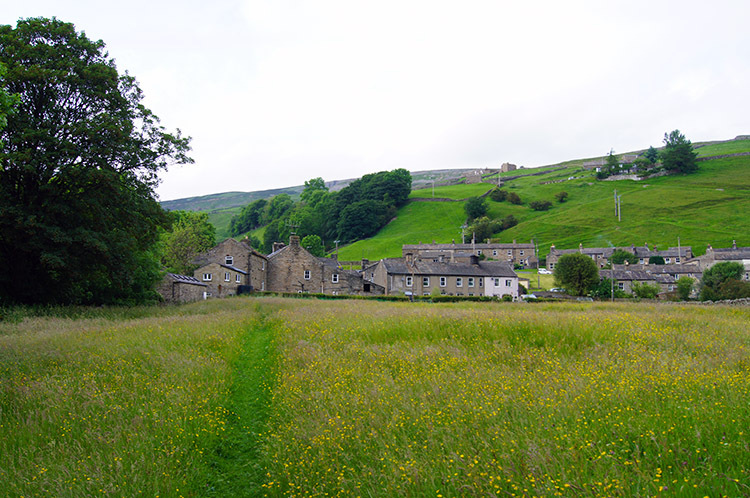 And I was lucky to be walking in Swaledale on such a lovely summer day; the sun shone brightly from dawn and it was predicted to stay in view for most of the day. 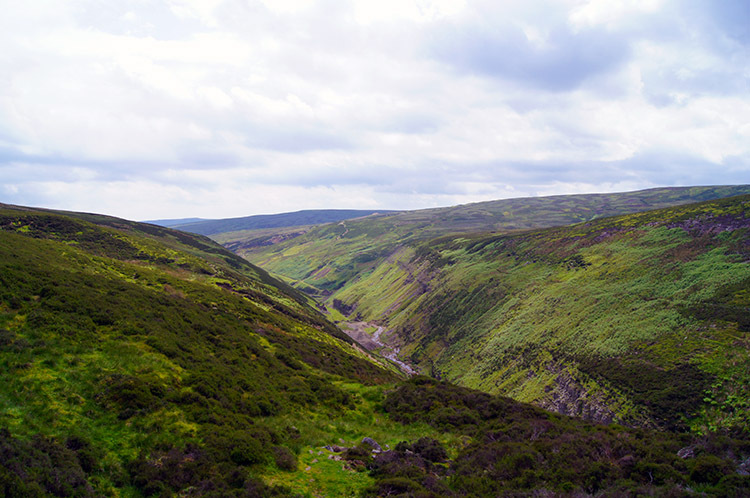 The last time I walked up Gunnerside Gill from the village I had stayed low and followed a path up the valley. 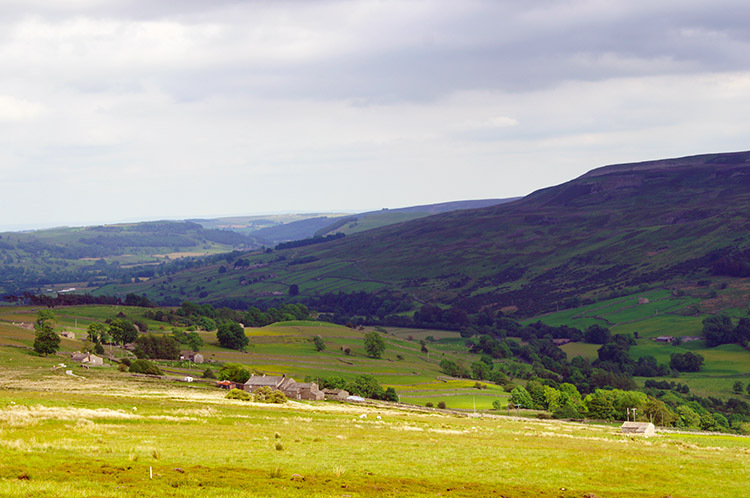 This time I chose to climb on to Gunnerside Pasture so I could look down on the village and the Swaledale valley. I was pleased I had done so, once I had made the steep climb of 150 metres to Jingle Pot Edge. 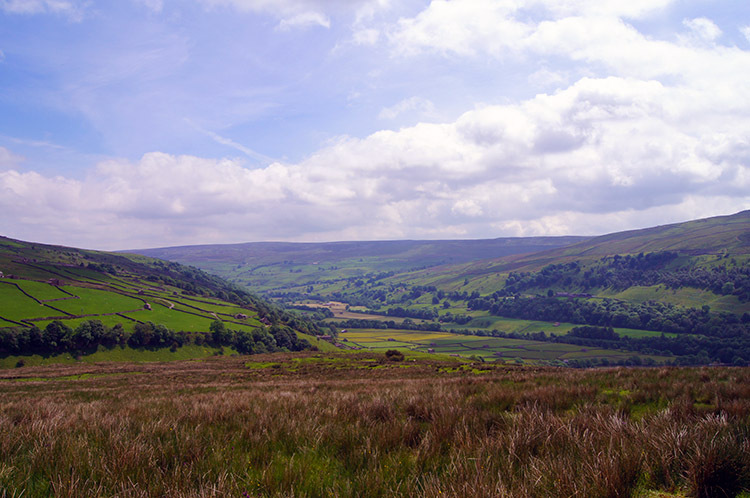 While ascending and breaking into a sweat on the hot balmy morning I kept stopping to look back to the rooftops of Gunnerside and the Swaledale valley stretching east towards Reeth. It was a beautiful sight to behold, the first of many I was to enjoy on this fabulous day out. From Jingle Pot Edge I followed the well made bridleway heading out across Gunnerside Pasture towards Botcher Gill Gate. To my left was the rump of Black Hill and to my right I could see across the valley of Gunnerside Beck to Winterings Edge. A little high cloud had formed in the skies; I hoped that would clear before long. Still the hazy sunshine offered respite from full sun as I headed along the track on the moor which I followed for 500 metres before reaching the point of my descent to Gunnerside Beck which I followed down and while doing so losing most of the height I had just gained. I completed my descent just downstream of Middle Bank and found a lovely spot by the beck which I sat by for a while, simply to take in the beauty of the surroundings. 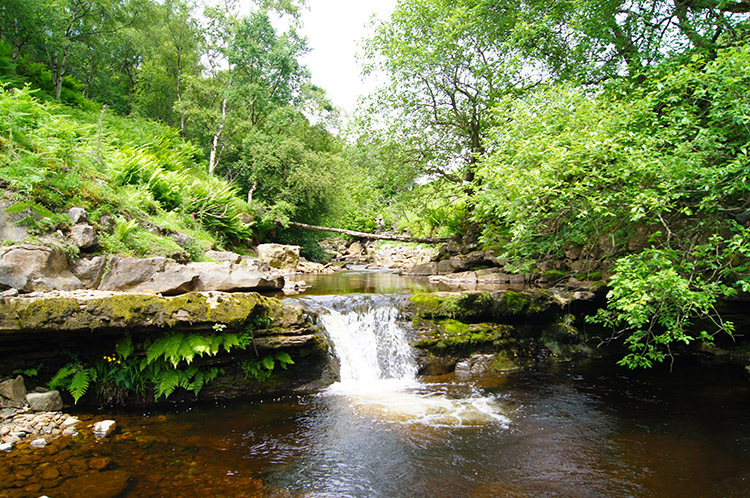 The beck trickled downstream on its course to meet the River Swale one and a half miles to the south. I followed the beck upstream, due north. Soon I came across the first evidence of old lead mining works beside Gunnerside Beck, an old building without a roof which in industrious times was the Mine Shop. A plaque on the wall read 'This mine shop overlooked a bridge that led to the Old Gang Company's dressing floor. 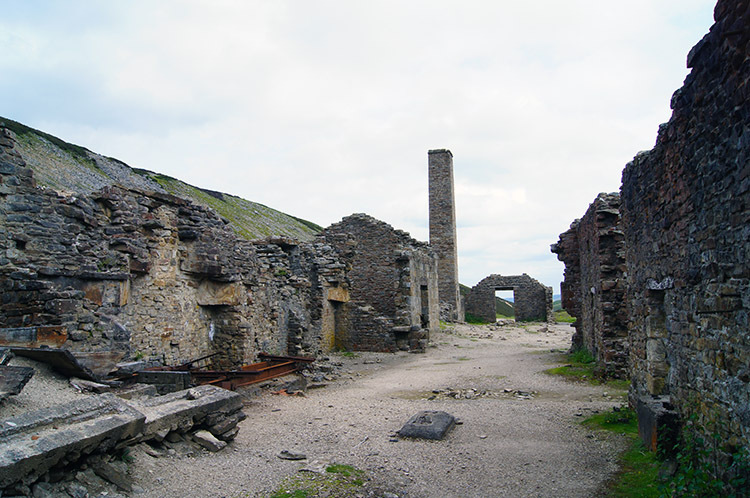 The low ruins near the stream are the remains of another mine shop'. 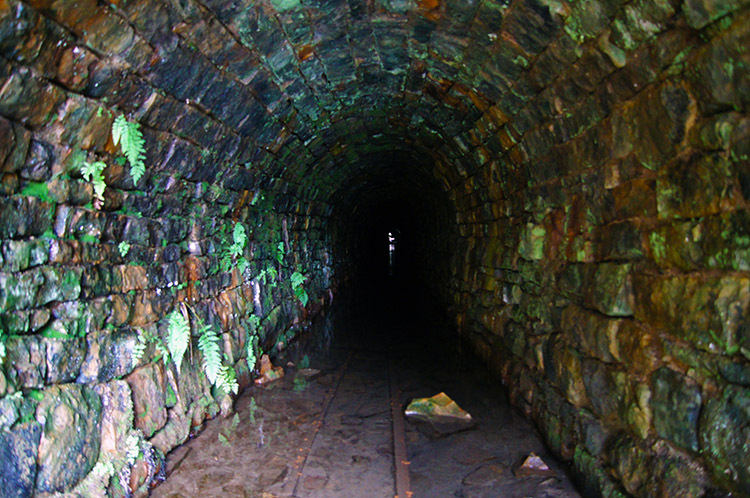 A few metres beyond the ruined mine shop was a restored water culvert with a marked stone on the apex of the arch with the words Sir Francis Level AD1874. It's construction was innovative at the time. After viewing the excellent workmanship of the culvert, albeit restored but still inspiring I decided to continue my walk by scrambling up the gill rather than follow the path I had previously. 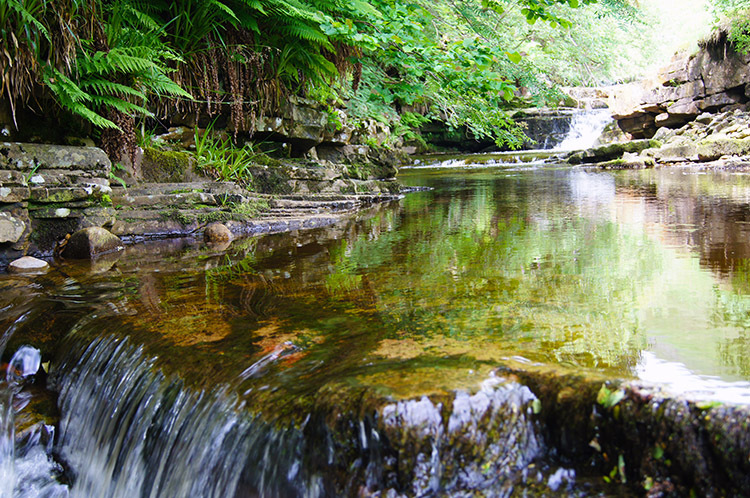 As the water level in Gunnerside Beck was low and the flow of water placid I found it to be not too difficult. Most of the time I walked along one edge of the beck and only occasionally having to step into shallow water or onto rocks in the stream to climb over the edge of small waterfalls. There was a series of them and the setting was quite awesome. To be up close was a real thrill. I continued scrambling up Gunnerside Beck for about 500 metres until I passed Botcher Gill Nook and reached Swina Bank Scar. Here the valley floor opened out so I could now walk easily and unrestricted towards Lownathwaite Mea and the site of three huge scars on the hillsides, the sites of North Hush, Gorton Hush and Friarfold Hush. Over 100 years since the end of industry and the hills are still barren of vegetation for vast swathes of the hillsides are deep in rock and dust debris caused by torrents of water forced downhill during frenetic lead mining exploitation. I saw this carnage to the natural landscape up on the raised paths last time. 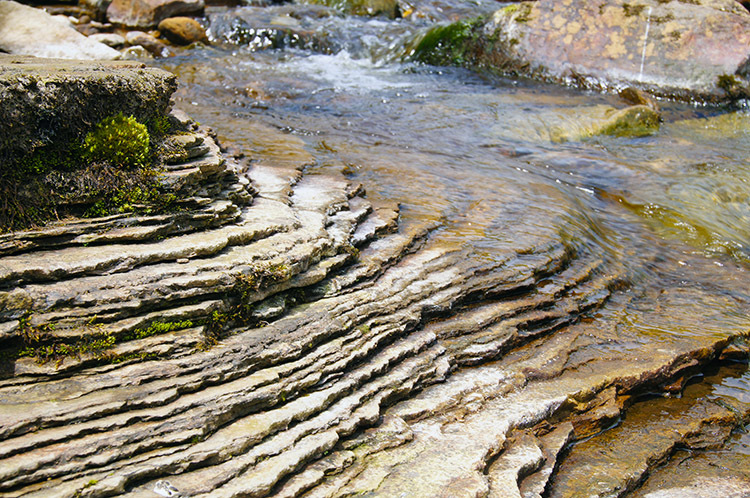 At least by being low I could see natural erosion in the beautiful layering of levels of the Yoredale Series caused by natural water flow in the gill. 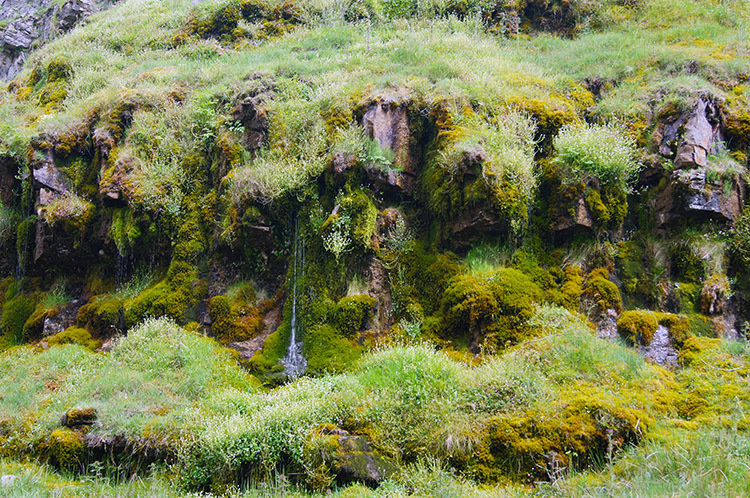 More water headed towards the gill from the hillside, some of it making the grass mossy and a rich green on rock outcrop overhangs. More impressive lead working ruins were to be enjoyed below Gorton Hush including the Blakethwaite Peat Store. The building was necessary as Peat was needed to fuel the ore-hearths to extract the lead from the indigenous rock in molten form. On the hillside above the peat store was a fine example of a rounded kiln. 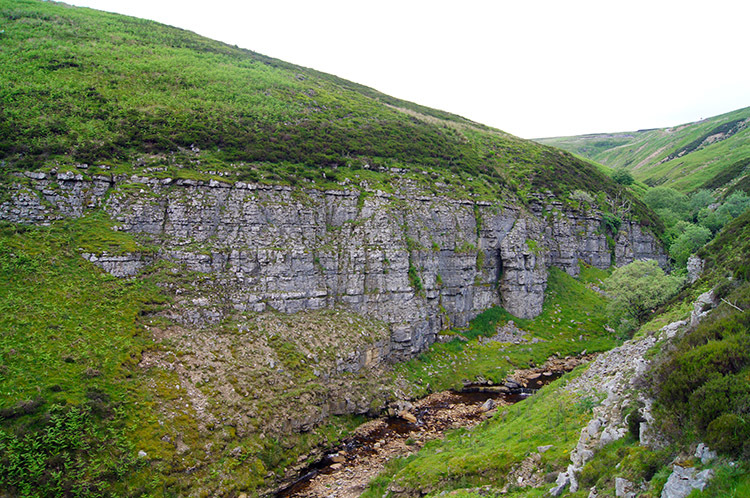 I continued on beyond the buildings and climbed from the gill to an elevated path on the west of the valley before descending to a pretty waterfall from where I crossed over the beck for the final time to continue north by climbing to a path which gave me a great view of Eweleap Scar. It is a lovely exposed rock cliff but I did not see any female sheep taking the leap while I was there. 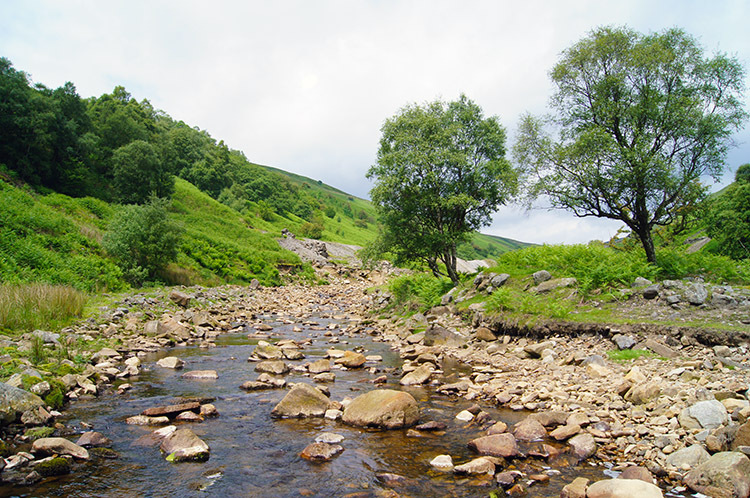 Continuing on my walk past Eweleap Scar I bade farewell to Gunnerside Gill and headed on a path up the east bank to reach a wide track on the moor top south of Blakethwaite Lead Mines. From my high vantage point I could look back to the direction from where I had come. It was a stunning last look down on Gunnerside Gill and across to Gunnerside Pasture from where I had descended to the beck. Most of my walk so far was laid out before me. After standing and taking in the moment for a minute I walked south and then turned east towards Friarfold Hush and Merry Field. As I walked I could hear rustling all around. 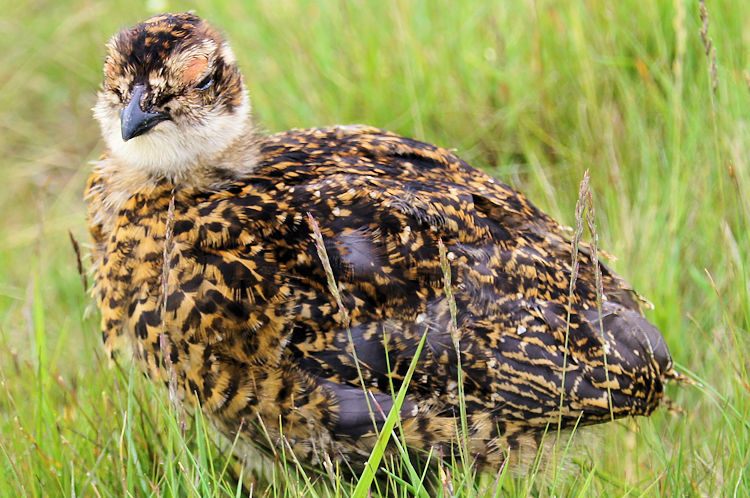 The ground was teeming with young Grouse. They seemed to be everywhere; it would have been a predators feast. Easy pickings for the not so sporting gunmen on the not so glorious 12th. They would not be able to avoid getting a bag full as most scampered around in all directions while I walked alongside them and past. Some even walked towards me. After the fun of the young Grouse festival I came to the upland part of Friarfold Hush and then to the vast open cast workings of Merry Field. It was like being on a different walk altogether as I crossed Merry Field as it was a sea of white and grey. I imagined a moonscape as the old mine workings have left a desolate trail across Friarfold Moor with much crushed debris everywhere. 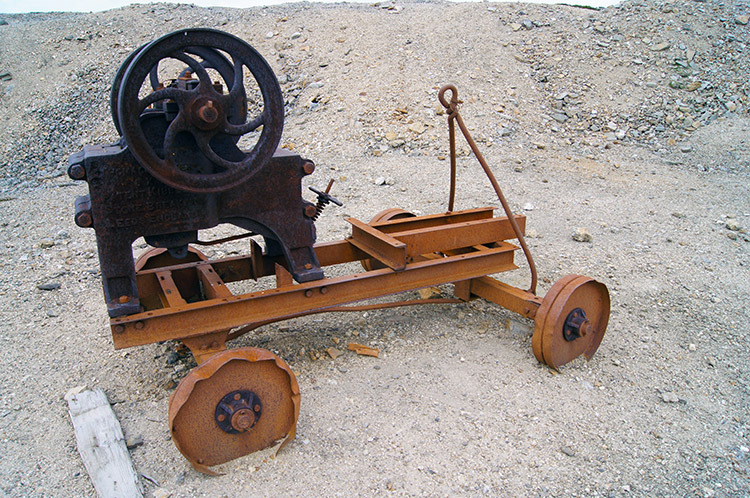 I even found one of the machines which caused such devastation, a stone crushing machine. It was stamped 'Tent Kibble, Stone Breaker, Leeds, England. 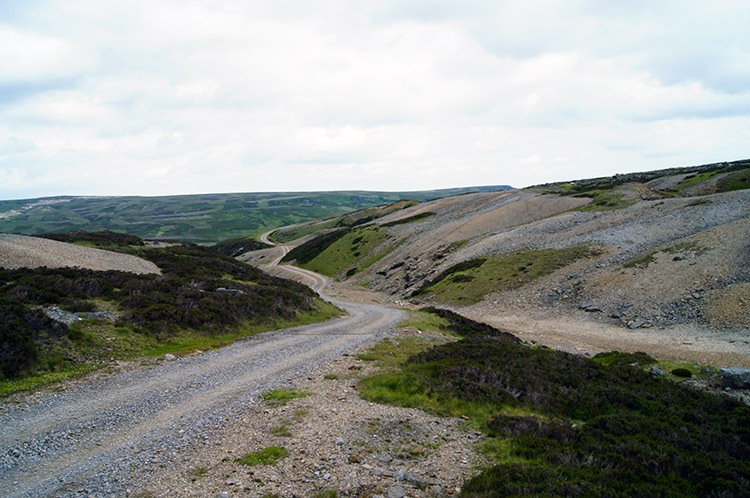 I walked off the moor on the track between the slag eastwards to Level House Bridge at Hard Level Gill. One could not fail to realise the history of the place with such names. After reaching the course of Hard Level Gill I was back onto a path I had not followed for a long time. It must have been 15 years since I had last been to Old Gang Smelting Mills. They had left such a deep impression of awe the last time I had visited I tried to think why it had taken me so long to return. But now I was and as I drew closer to the site the anticipation grew more palpable. I walked on excitedly for a while and then I could see my goal, what I feel is the most impressive derelict lead mining site of them all. There are quite a few buildings, some nearly razed but some with almost undisturbed walls. Most impressive of all is the chimney, completely intact. Many must have worked here in the mills heyday though little is now known. I explored the site for a good half hour and then stayed sometime more. It was time for lunch. After lunch I continued following the track by Hard Level Gill to Surrender Bridge, another place I had not visited for far too long. Why the bridge has such a name continues to strike debate, the two leading theories that a) there was once a Surrender Mine and b) that mine workers carrying ware had to surrender a toll before crossing. Both sound feasible. 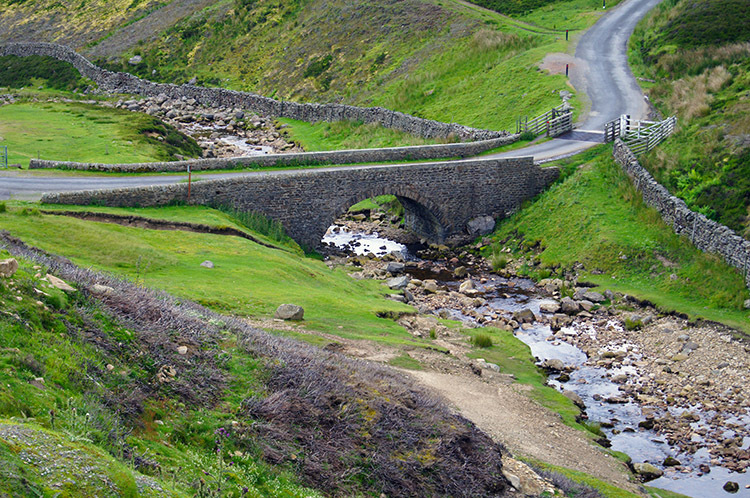 I crossed Surrender Bridge and followed the road linking Arkengarthdale to Swaledale south and uphill for a couple of hundred metres before I left the roadside to cross Feetham Pasture on a south west course back towards Swaledale. Once on the brow of the pasture I was blessed with exquisite views of the Swaledale valley once more. The only distraction from the view were circling Lapwings and Curlews who deemed I was giving their ground nests too much attention. I was accompanied by them all across the moor until I descended off the tops to Blades, probably one of the most remote hamlets in all of the Yorkshire Dales. There is only one way up to Blades on a steep switchback road from Feetham and it does not go anywhere but the scattered settlement. If you are looking for a quite life, then this place could be a contender for you. 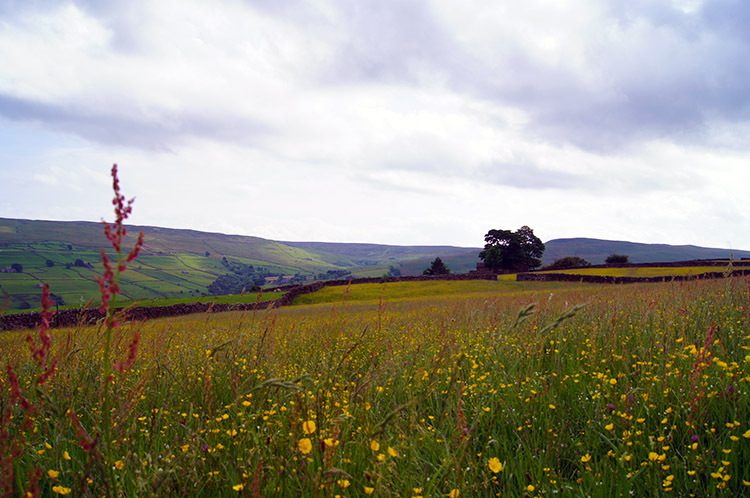 From Blades I continued down the north side hills of Swaledale towards the valley floor, Most of the walking was lovely on a good path and some of the fields crossed were a privilege to be in, lush colourful flower meadows. Only after the unoccupied building named Smarber was the going hard, a fairly steep descent though thick vegetation including high thick clumps of nettles. This bit needed a serious seeing to I though as I struggled through the jungle with arms outstretched high. Fortunately I got through the obstacle unscathed to follow the path though a narrow copse to the valley road at Rowleth Wath. 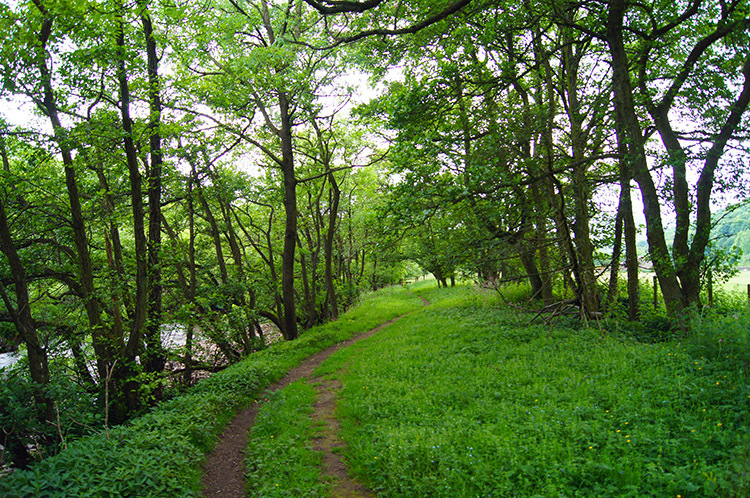 On reaching the road I followed it for around 400 metres until I left it to reach a path which tracked through exquisite narrow woodland avenues beside the River Swale. It was joyful to walk along the path here. I was to speak to the Gunnerside Women's Institute about my walking adventures in the early evening and I had two hours to pass before I was due to talk so with just an half hours walking to go I decided to find a suitable spot to stop for tea. And on a wide shallow strait of the River I found the perfect spot to take my long leisurely break. It was around 5.00pm, it was calm and the only noise to enjoy was a slow flowing river and the sound of bird song. Occasionally I heard a splash and looked to the river seeing signs of a fish leap to catch a fly. It was a serene teatime enjoyed. 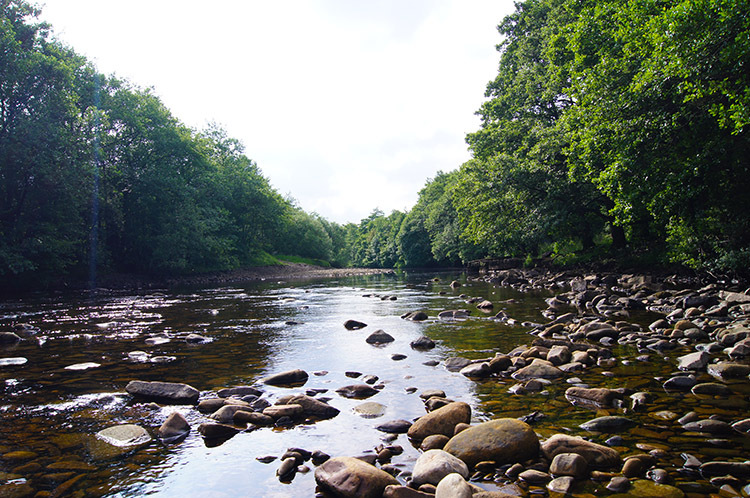 I still had time to amble along the river bank and play skimming stones by Gunnerside Bridge. Oh what boyhood reverie I had, great fun and a fitting end to a great walk. Indeed it was a great walk, one of great contrasts and most fulfilling. I climbed to height and I descended to valley floors. I scrambled up becks. 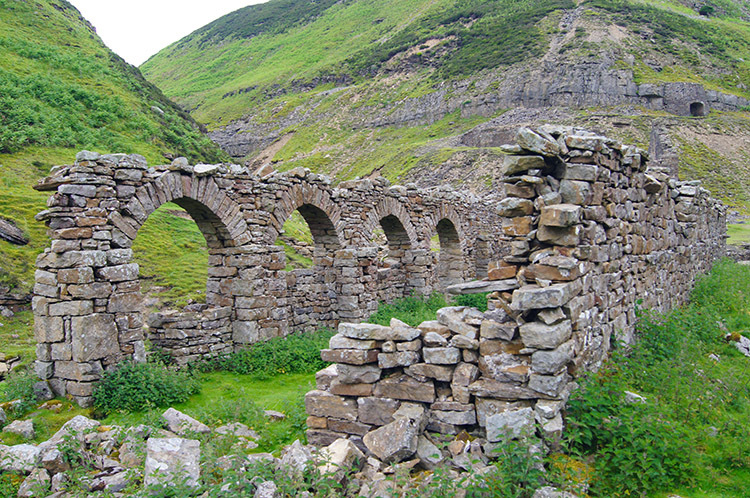 I explored the history of lead mining in the Swaledale area. I crossed flower meadows. I came through nettles unscathed. I enjoyed the best spots for lunch and tea. I skimmed stones once more. And to cap it all I enjoyed a wonderful time talking with the Gunnerside Women's Institute (and some gentlemen who were invited). It was a brilliant day.